Everyday, Bark’N’Borrow celebrates the love and value that dog’s bring to our daily lives, and August 26th marks the day that the nation does too - it’s National Dog Day! What better way to celebrate man’s best friend, than to give back to the dog community by launching the new and improved version of Bark’N’Borrow on this festive day. In the spirit of this special holiday, Bark’N’Borrow has partnered with the iconic LA based Pink’s Hot Dogs, and is throwing National Dog Day event at the Pink’s Restaurant. This event will honor man’s best friend, celebrate the release of Bark’N’Borrow 2.0, and raise awareness for homeless dogs locally and nationally. BYOD: Bring Your Own Dog!!! Celebrate National Dog Day with Dawgs! The ‘Hot Dawg Eating Competition’ kicks off at 11:45am, playing off Nathan’s Famous Hot Dog Eating Contest. However, this rendition will see 4 dogs, each representing a local animal shelter, competing to be the first to finish the bowl of dog food in front of them. Participating shelters include Best Friends Animal Society, Wags’N’Walks, NKLA, and What's Up Dog!. The dog who is crowned winner, will have their represented shelter awarded a grand prize donation of $400, followed by $200 for second place, $100 for third, and $50 for fourth. During the 2 hour event, there will be a ‘Hot Dawg Eating Competition’ playing off Nathan’s Famous Hotdog Eating Contest. However, this rendition will see 4 dogs, each representing a local animal shelter, competing to be the first to finish the bowl of dog food in front of them. Participating shelters include Best Friends Animal Society, Wags’N’Walks, NKLA, and Karma Rescue. The dog who is crowned winner, will have their represented shelter awarded a grand prize donation of $400, followed by $200 for second place, $100 for third, and $50 for fourth. Attendees of the event will be able to purchase $1 raffle tickets and place bets on which dog will be the winner of the competition. A winning ticket will be drawn from the pot of the winning dog, and that person will receive a gift card for Pink’s valued at $25, a bag of Bark’N’Borrow swag, and a year’s free subscription to the Bark’N’Borrow app. All proceeds of the raffle will be donated to the respected shelters. Available for purchase on the day will be Bark’N’Borrow t-shirts, tank tops, hats, bracelets and dog t-shirts; all of which 10% percent of the marked price will be donated to Best Friends Animal Society. In the spirit of this special holiday, Bark’N’Borrow has partnered with the iconic LA based Pink’s Hot Dogs, and is throwing National Dog Day event at the Pink’s Restaurant in Hollywood. This event will honor man’s best friend, celebrate the release of Bark’N’Borrow 2.0, and raise awareness for homeless dogs locally and nationally. During the 2 hour event, there will be a ‘Hot Dawg Eating Competition’ at 11:45am, playing off Nathan’s Famous Hotdog Eating Contest. However, this rendition will see 4 dogs, each representing a local animal shelter, competing to be the first to finish the bowl of dog food in front of them. 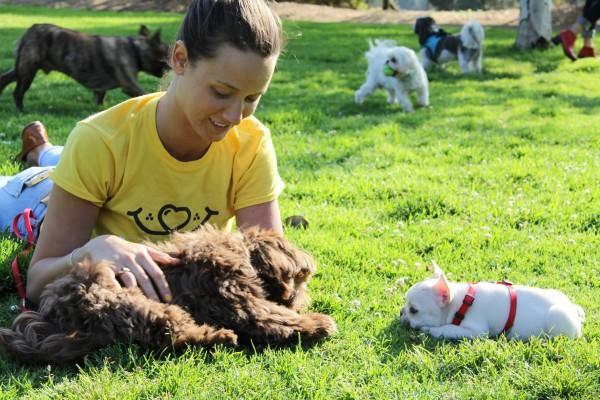 Participating shelters include Best Friends Animal Society, Wags’N’Walks, NKLA, and Karma Rescue. The dog who is crowned winner, will have their represented shelter awarded a grand prize donation of $400, followed by $200 for second place, $100 for third, and $50 for fourth.